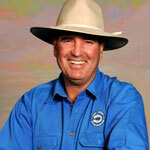 Jim Lindsay was born in 1957 and raised on a two million-acre cattle property in far south-west Queensland, and his association with stock has been 'before he could remember'. After leaving school at an early age, he worked as a stockman and horse-tailer on North Queensland Gulf properties, before returning to the south-west country, to run a stock camp and contract muster. 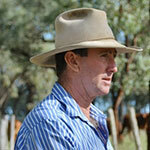 He has been involved with large herd management in extensive areas as well as droving cattle. 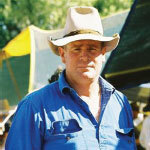 In 1980 he purchased his own cattle property in north-west Queensland, in the Hughenden area, and has been conducting working dog and Stockhandling Schools since the early nineties. Jim believes that one's attitude is the key to obtaining benefits both to people and livestock and promotes harmony between man, and dog, and animal, in the working environment. Chook Kealey has been conducting Low Stress Stockhandling schools since 2002 and has worked with a number of commercial industries over the years that include cattle, sheep, goats, horses, camels, buffalo, feedlots, meatworks, saleyards, dairies, universities and corporates. He lives near Walcha in New South Wales where he runs a commercial cattle and sheep enterprise. 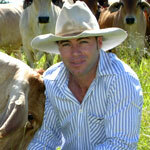 Tim grew up on the family property in the Granite Belt region in south-east Queensland. 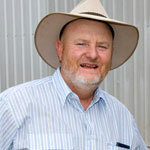 After surviving a number of drinking sessions at the University of Queensland, Tim graduated with a Diploma of Applied Science and spent ten years working as a stock inspector for the Department of Primary Industries in various positions across western Queensland. After years of inspecting hundreds of thousands of head of livestock, Tim decided to take his stockhandling skills a step further. He completed a stockhandling school with American legend Bud Williams and spent time travelling with LSS founder Jim Lindsay. The encounter completely changed the way Tim perceived stockhandling. He realised his previous methods involved much force - and stress to the animals - and was subsequently costing the livestock industry millions of dollars. Nine years later, and Tim continues to repay his debt to the livestock industries as a lead trainer conducting LSS schools across Australia. His passion and enthusiasm for LSS is driven by the empowerment that comes with showing people an easier, enjoyable and more profitable way of handling livestock. Tim is married to ABC radio and television journalist Kristy Sexton-McGrath and they have a beautiful little girl, Ava. Tim, Kristy and Ava (not forgetting Gemma - the Kelpie), live very happily together in Cairns. Grahame Rees grew up and spent most of his life on the family properties at Ivanhoe in western NSW. After attending a Stockhandling school in 1999 with Bud and Eunice Williams he realised there were huge benefits in handling animals differently. In 2002 he teamed up with Jim Lindsay to share these advanced animal handling skills and has since trained over 1800 people across Australia. Grahame says "I am constantly surprised by the achievements by Graduates of LSS. Both sheep and cattle producers are finding increased animal performance, easier handling in all situations with less effort and labour. Whether it is imprinting and weaning calves and lambs, settling bought stock or handling our livestock in the paddock or the yards everyone seems to find something to improve their livestock operation." He believes the added benefit of having people work in a Low Stress environment leads to a safer workplace and staff satisfaction. Rod is a beef producer who grew up at Coonabarabran on his family's property. In 1986 Rod won a scholarship, sponsored by the CWA, that enabled him to spend 4 months in the USA and Canada studying beef production, processing and marketing. On his return Rod worked as Executive Assistant to the chairman of the Meat industry Authority also running stock handling seminars across NSW for the authority. Rod, his wife Isobel and their three children ran their beef breeding and fattening operation at Binnaway. While trading stock on agistment on many properties Rod was introduced to Bud Williams and adopted many of Buds methods immediately. Rod joined LSS in 2002 to improve his skills further. Now based at Tamworth Rod predominantly trades sheep & cattle. Through Rod's involvement with Low Stress Stock Handling School he has a natural teaching ability balanced with real life practical experience. 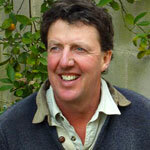 Nic Kentish was born in 1964 and raised on his families' farm near Mt. Gambier in South Australia. After leaving school, he set about pursuing a career that often led him "somewhere east of the sunrise". A passion for livestock has been his driving force from jackerooing days on NSW, Qld and WA stations to overseeing a cattle development project in Vanuatu to head-stockman aboard livestock ships delivering sheep, cattle and goats to Middle-Eastern ports. Combining his passions for livestock and people, Nic trains Low Stress Stockhandling Schools with zest, humour and feeling and a genuine endeavour to see animals and humans together realize their true potential. Since animals are simply good at being animals, Nic takes up the human challenge to share what's possible if people can change.